Korean cuisine is something I know next to nothing about. Vague images of BBQ and steamboat, kimchi (fermented spicy cabbage) and – er – well that’s about it. So when Meemalee suggested the suggestively named Tohbang for a quick lunch I jumped at the chance to try something new. As far as I can tell Korean food shows some clear influences from northern China and Japan, both of whom have had major influence on the peninsula throughout its history. But there is plenty that seems (to my uneducated eye) uniquely Korean. 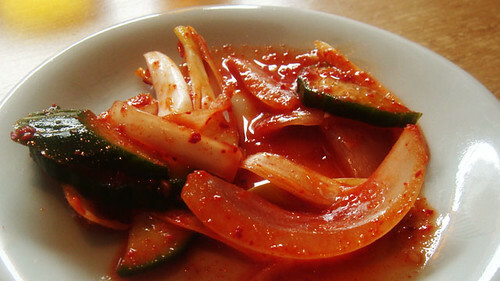 Yukhoe dolsot bibimbap for instance. Recommended as a great intro to the cuisine this was an intriguing dish. Somewhere between Japanese katsudon and a steak tatare, it arrived at the table in a sizzling stone bowl. Small piles of thinly sliced raw vegetables such as bean sprouts, courgette and carrots sat atop a pile of sticky rice. 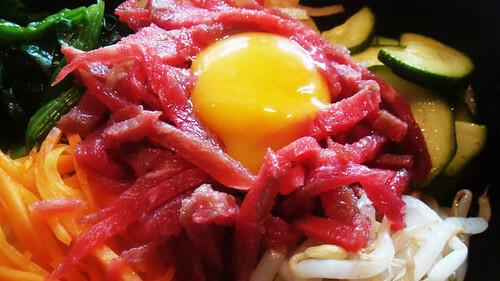 Crowning it all was a slivered mound of raw beef and a wibbly raw egg yolk. As instructed we covered the whole with great swirls of chilli sauce and mixed it all up with gusto. For someone who often compartmentalises the food on his plate, this was a curiously exciting thing to do. Mixing madly like a demented three year high on Pepsi, I somehow managed not to spray everything within a five foot radius with globules of yolk, sticky rice and chilli sauce. It tasted fabulous, surprisingly gentle in flavour, but in a hearty way. Even with the chilli sauce the flavour wasn’t too strong. Almost raw beef and vegetables were all bound together with the just-cooked egg while the chilli provided an underlying heat. This is the perfect cold-day food, warming. Something I would definitely come back to. The whole thing was pretty reasonable too, with some fermeneted chilli pickled potatoes and other vegetables and a hite beer, it came to £13 a head. And that was for a properly filling lunch. So lovely to meet you, Mr Grubworm – see you next week? Can I just say Tohbang stole my bibimbap cherry? @Mathilde it’s an exciting new one to try, in a couple of meals I haven’t even begun to scratch the surface. Something that will have to be remedied this year I think. Happily London does give you a way in. @meemalee still feeling bad about that! Next week it’ll have to be. If I haven’t expired from over eating in the meantime. Really enjoyed the lunch. Have to make it a longer meal next time round. Mmmmm – never tried Korean grub but this does look good. Great review. 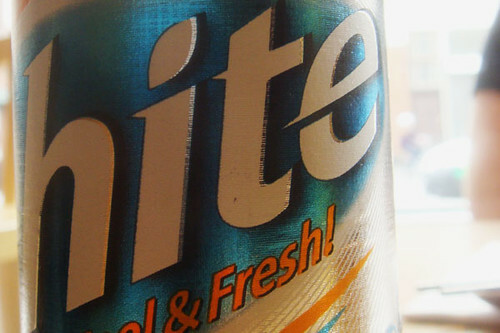 I know I am a big child but I love to think that there’s a missing capital ‘S’ on that bottle of hite beer. That and the name of the place ‘Tohbang’ and I’m having visions of Sid James and Kenneth Williams. Getting away from the cheap innuendo, the bibimbap looks great! @franmouse it’s definitely worth trying, I found it both tasty and interesting. I fell in love with Korean food when I visited Edinburgh (of all places!) in Jan. We went to a great Korean restaurant there, called Shilla, and really loved it! Shame there isn’t one where I live, but I did kind of try recreating one of the dishes I had there. A clam and silken tofu stew. Delish! Love the name of the place too! In more ways than one! Did anyone say cheap innuendos? ehm…. @Maninas – it’s a great name isn’t it? Had me smirking right through lunch. The silken tofu and clam dish sounds great, do you have a link to a recipe anywhere? the tofu and clam dish is called Sundubu Jjigae (pronounced SOON-doo-boo CHEE-geh). Sue of My Korean Kitchen has a recipe at http://mykoreankitchen.com/2006/11/29/uncurdled-tofu-stew-sundubu-jjigae-in-korean/.